We invite 2D artists to join us and spend a day painting or drawing in Dublin. Registration table will be at the corner of High and Bridge St.
You may enter in your GPS 12 W Bridge St, Dublin, OH. Stamping. Get your support stamped before you start painting. – Artist may get several BLANK supports stamped and pay only one entry fee of $15. – If at the end of the day artists want to submit multiple entries, he/she has to pay an extra $10 per additional entry. Cost: The entry fee is $15.00 for the first entry, $10 for any extra entry. Where: Artists are allowed to set up their easel anywhere in the Historic Dublin area, preferably on streets where the public may enjoy their work. The preferred subject matter is the Historic Dublin cityscape but is not limited to that. All media except photography is allowed. All styles will be considered and will be judged on the merit of the final work. Important: All paintings must be turned in, completed and framed (or wired for hanging), by 3 pm. et paintings, drawings, and watercolors must be framed. Unframed canvases are allowed, but must be dry and wired to hang. Judging: The juror, renown artist Michael McEwan, will judge the entries after they are hung at the UA Library. 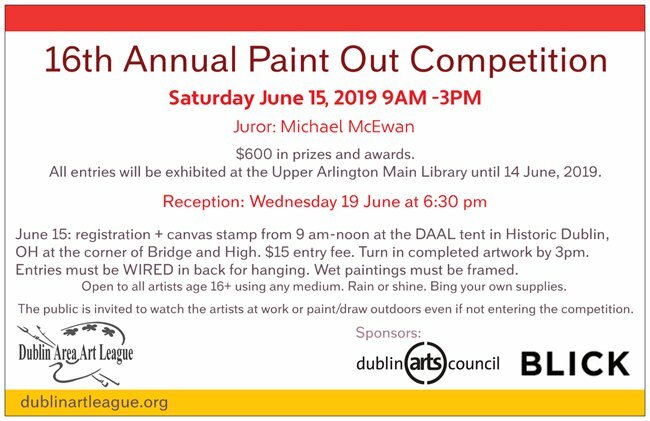 Prizes: Best of Show $200, funded by the Dublin Arts Council. 1st Place $100, 2nd Place $75, 3rd Place $50. Merit Award $100 Blick card. 3 Honorable Mentions which will $25 Blick card each. Winners will be announced at the reception on June 19th. Reception: Wednesday, 19 June 2019, 6:30 – 8 pm. If a painting sells during the exhibit, all transactions are between the artist and the buyer, and 100% of the proceeds goes to the artist. 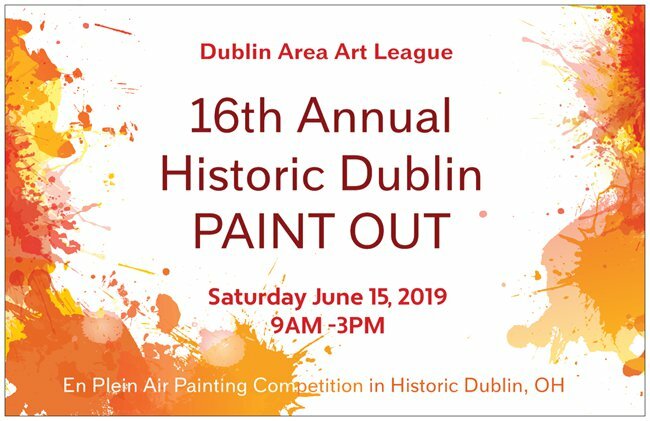 The Historic Dublin Paint Out is partially funded by the Dublin Arts Council though a Community Arts Grant to encourage community engagement, cultivate creativity, and foster life-long learning through the arts. Planning on Attending the Paint Out? Please help us have a head-count, pre-register online. If paying online, use the "pay now" button below after you submit your registration.